It is frustrating when the temperatures outside are frigid, but your heat pump is blowing cold air instead of warming the inside of your home. You turn the heat pump off and back on to see if you can “reset” the heating unit, but that does not work. You immediately assume that you need to search for heating contractors in the East Alton, IL area to perform a furnace repair. However, there could be another reason why your heat pump is blowing cold air. Is the Heat Unit Really Blowing Cold Air? A heat pump warms your home by moving heat from the air outside of your home into your home. Therefore, when the temperature outside falls, the temperature of the air being blown into your home can fall slightly. The air is still warm enough to heat your home; however, the air may seem “cold” if the air temperature is slightly lower than your body temperature. For example, if the air coming from your heat unit is 85 degrees, the air is still warm, but the air may feel cool to a person whose body temperature is normal (98.6 degrees). An easy way to check to see if the air coming from the heat pump is warm or cool is to monitor your thermostat. Check the thermostat inside your home every 30 minutes for an hour or two. If the temperature remains constant or increases, the air from your heat pump is warm, but it may feel cold to you. Is the Heat Pump in Defrost Mode? 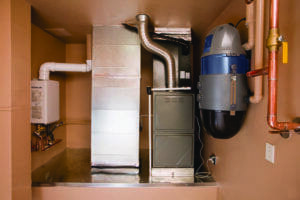 Your furnace may be blowing cold air if the heat pump is in defrost mode. When a heat pump is in defrost mode, the unit blows cold air for a couple of minutes before returning to normal mode. Why does this happen? When the temperature outside falls, the unit’s outdoor coils can frost over. Rather than allowing the coils to freeze completely, the unit enters the defrost mode. The heat pump changes over to cooling mode for a couple of minutes to force the coils to heat up. This process melts any frost or ice from the coils preventing them from freezing. In a few minutes, the unit returns to regular mode. You can usually tell when the unit switches into defrost mode by checking the outside unit. If the fan is not spinning and you see a puff of steam, the unit is probably in defrost mode. In some cases, there could be something wrong with your heat pump that requires a furnace repair by an East Alton, IL heating contractor. Common furnace repairs that our heating contractors perform on heat pumps include refrigerant leaks, replacement of faulty components, and replacement of a bad reversing valve. 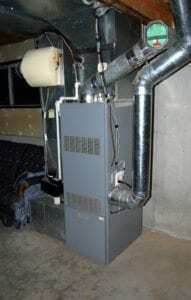 In addition, lack of routine service and maintenance can cause a heat pump to lose efficiency. A maintenance call can usually correct an efficiency problem. The East Alton, IL heating contractors of B & W Heating and Cooling are ready to help you with your furnace repair. We provide service for all heat units and heat pumps. Does my Glen Carbon, IL home need a humidifier?